[135 Pages Report] The global content services platforms market size is expected to grow from USD 22.6 billion in 2018 to USD 60.3 billion by 2023 at a Compound Annual Growth Rate (CAGR) of 21.7% during the forecast period. 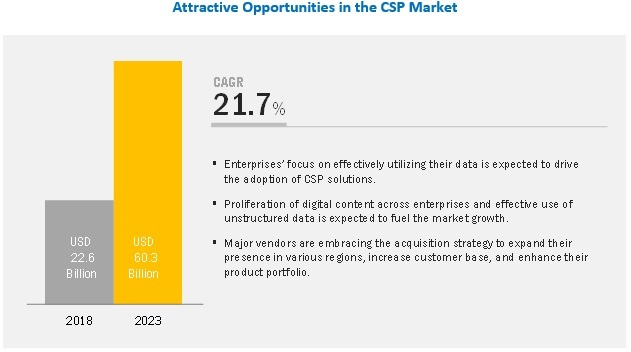 Increased automation and agility, need for delivering enhanced customer experience, and increased cost savings and return on investment are some of the major growth factors for the CSP market. On-premises deployment of CSP solutions requires initial high investment by organizations, though it does not require incremental costs throughout the ownership, as in the case of cloud deployment type. Nowadays, corporate data can be easily accessed from mobile devices; this has increased the volume of data transfer between business parties and has raised the risks of cyber-attacks and data losses. Therefore, security concern associated with private data of customers is a major reason for the adoption of on-premises deployment over the cloud. These types of deployments are popular across large-sized enterprises. Banking, Financial Services, and Insurance vertical accounts for the largest market size during the forecast period. CSP solutions for banking and financial services companies provide comprehensive platforms to capture, manage, and analyze content for financial services. the solutions pertaining to the BFSI sector offer benefits, such as the expansion of customer service offerings and self-service capabilities to increase the client interaction value chain, and enhanced customer service levels. The 2007 financial crisis has put the limelight on banks that have been under fire for providing risky loans. These risky loans along with weak regulations and poor documentation were the perpetrators of the financial crisis. The deployment of CSP solutions in the BFSI sector can ensure better accountability, risk management, operational management, document and records management, end-to-end content governance, management among different functional departments, and content reporting and analytics. Asia Pacific (APAC) is expected to provide significant growth opportunities during the forecast period. The increasing availability of skilled labor and keen focus provided by SMEs and large enterprises to enter and grow in this region are a few factors driving the adoption of CSP in this region. Especially, public cloud services have gained huge traction in APAC, as enterprises seek to enhance their digital initiatives. With the pressure to achieve greater business agility and satisfy their customers, CSP has become the core of how businesses operate nowadays. Organizations are working on optimizing both application performance and ensuring good customer experience. Major vendors in the market include Microsoft (US), Hyland (US), OpenText (Canada), Box (US), Laserfiche (US), Adobe (US), IBM (US), M-Files (Finland), Nuxeo (US), Objective (US), Fabasoft (Austria), Micro Focus (UK), GRM Information Management (US), Everteam (France), DocuWare (Germany), Alfresco (US), Newgen (India), SER Group (Germany), and Oracle (US). In April 2018, Hyland acquired OneContent business from Allscripts, a leading provider of healthcare information technology solutions. In July 2017, Hyland acquired Perceptive business unit of Lexmark International. In August 0218, OpenText launched Legal Center, a cloud-based EIM application, designed to integrate with OpenText eDOCS and manage client onboarding and document sharing. In January 2019, OpenText acquired Hightail, a leading cloud service for file sharing and creative collaboration. In January 2019, OpenText acquired Catalyst Repository Systems, a leading provider of eDiscovery solutions for corporate legal departments and law firms. In March 2017, Box expanded its Box Zones in London and Frankfurt, powered by the IBM Cloud. This expansion would help the company centralize content and enhance productivity while addressing local data storage requirements. In May 2018, M-Files expanded its operation in Denmark to address the increasing demand for information and document management among end users in this country, as companies prioritize information management as the top task. How will the acquisition made by leading vendor shape the market in the near future? Which segment provides the most opportunity for growth? Which are the leading vendors operating in this content services platforms market? The study involved 4 major activities to estimate the current market size of the content services platforms market. Exhaustive secondary research was done to collect information on the market and the peer market. The next step was to validate these findings, assumptions, and sizing with industry experts across the value chain through primary research. Both top-down and bottom-up approaches were employed to estimate the complete market size. After that, the market breakup and data triangulation procedures were used to estimate the market size of the segments and sub-segments. The market size for companies offering content services platform solutions and services was arrived at on the basis of the secondary data available through paid and unpaid sources, and by analyzing the product portfolios of the major companies in the ecosystem and rating them according to their performance and quality. In the secondary research process, various sources were referred to, for identifying and collecting information for this study. The secondary sources included annual reports, press releases, and investor presentations of companies, white papers, journals, certified publications, and articles from recognized authors, directories, and databases. Secondary research was mainly used to obtain key information about the industry’s supply chain, the total pool of key players, market classification and segmentation according to industry trends to the bottom-most level, regional markets, and key developments from both the market and technology-oriented perspectives, all of which were further validated by primary sources. In the primary research process, various sources from both the supply and demand sides were interviewed to obtain qualitative and quantitative information for making this report. The primary sources from the supply side included industry experts, such as Chief Executive Officers (CEOs), Vice Presidents (VPs), marketing directors, technology and innovation directors, and related key executives from various key companies and organizations operating in the content services platforms market. After the complete market engineering (including calculations for market statistics, market breakup, market size estimations, market forecasting, and data triangulation), extensive primary research was conducted to gather information, and verify and validate the critical numbers arrived at. 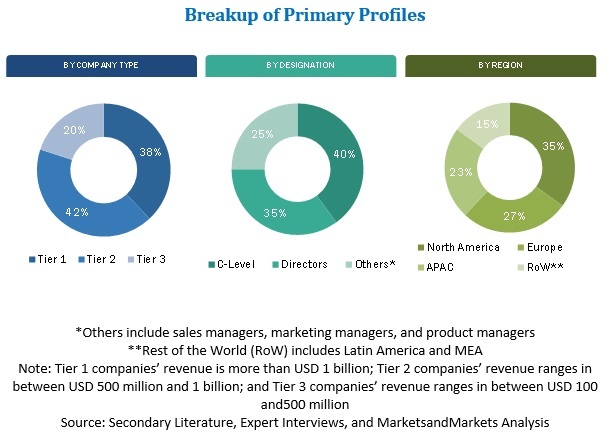 Primary research was also conducted to identify the segmentation types; competitive landscape of content services platform solution and service providers; and key market dynamics, such as drivers, restraints, opportunities, challenges, industry trends, and key players’ strategies. After arriving at the overall market size using the market size estimation processes as explained above, the market was split into several segments and subsegments. To complete the overall market engineering process and arrive at the exact statistics of each market segment and subsegment, the data triangulation and market breakup procedures were employed, wherever applicable. The data was triangulated by studying several factors and trends from both, the demand and supply sides, in the content services platform market. With the given market data, MarketsandMarkets offers customizations as per the company’s specific needs and on best effort basis for profiling of additional market players.